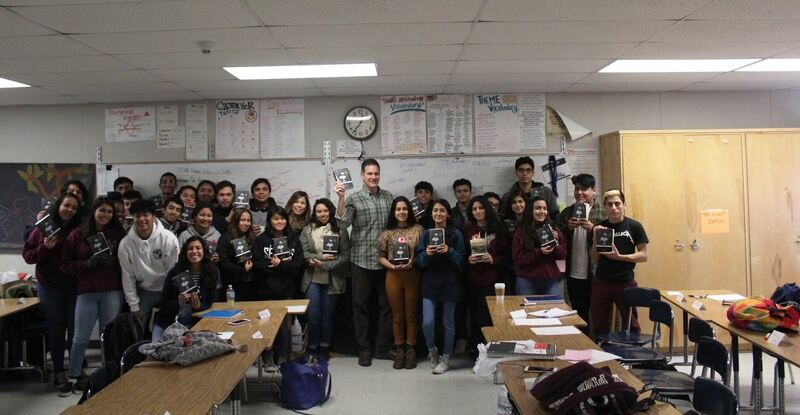 On January 27 and 30, Dr. Jon Varese of the Dickens Project presented a contextual, historical, lesson based on George Eliot’s Middlemarch to NAI seniors. As the lesson mapped out the publication history Eliot’s novel alongside Dickens’s career, students investigated a wide range of issues: the implication of serialization and its impact on literacy; the democratization of reading; Dickens’ status as the “first international celebrity”–a phenomenon made possible by the rare intersection of art, technology and history; Eliot’s own choices to challenge a popular formula–her decision to “say No to Dickens”; Eliot’s conception of beauty and how that might have impacted her own work; the “incognito” phase, and the ramifications of her choice to use a pseudonym–even to the end of her life. A curious yet fascinating object emerged from this investigation of time–the tomb. Students were riveted by the details that Dr. Varese revealed, paradoxically causing the authors to come “to life” in their imaginations. For instance, they learned that Dickens’s grave was littered with offerings, from ornate floral displays to anonymous daisies plucked by the wayside, illustrating his universal appeal, even after death. 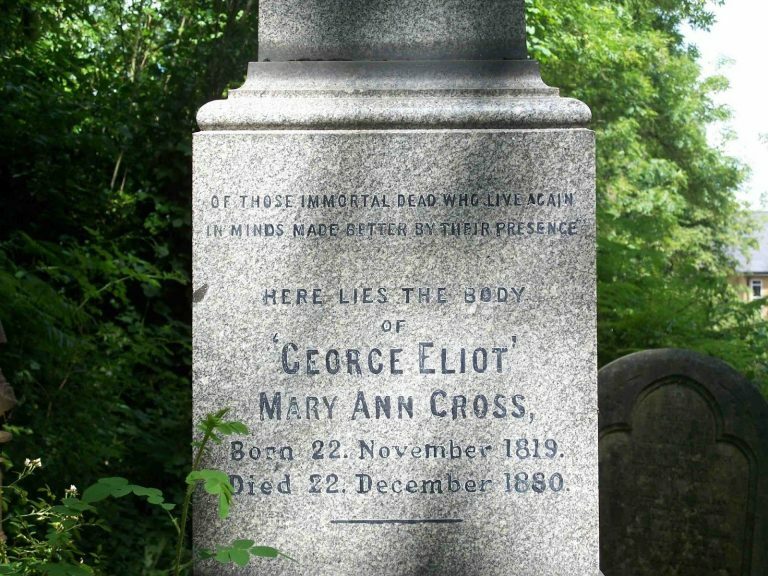 Eliot’s tomb, graven with an imposing “George Eliot” over the inscription, “Mary Ann Cross,” presented its own complicated text. Dr. Varese poignantly suggested that the last lines of Middlemarch may speak not only about the protagonist, but about the author, too. I believe that through Dr. Varese’s words, I was able to understand the true meaning of this novel. There were key things that I paid attention to, and things that I understood, but for each passage, I couldn’t find the true connection in the novel. For my essay I wrote about the vision of sympathy and how it changes a person, I believe that I had a sense of this passage, but not how it related to the novel completely. I believe that the true question that the novel raises is: What is the true meaning of beauty. Dr. Varese taught us about timelines, and what I learned was how the author lived, in what time period she lived in, and what notions society had in that time. The fact that Mary Anne Evans actually called herself George Eliot in order to have more “ratings” makes one notice that it was a time of struggle for women. Another very interesting things that I learn, that I believe relates to the novel, was that Mary Anne Evans was a very ugly woman. I believe that through the novel, she was trying to redefine the meaning of beauty. Dorothea, in the passage of Dorothea and Lydgate, I noticed how Dorothea is able to use her sympathy to change someone’s vision about others. She accomplishes a communal effect. I thought this was all due to the power of community and sympathy but with the wise words of Dr. Varese, I believe the author is trying to demonstrate the real meaning of beauty. Beauty is not on the outside, but the beautiful actions you make to have a communal connection with others. We see the way in which Rosamund is very beautiful on the outside, she is the ideal woman, she can play the piano, she is beautiful, she was the start student in the academy for women, but she gets stuck in her beauty. Due to her egoistic beauty, she fails in her marriage, the one thing that everyone knows she will be good at. This way showing that nothing is assured and that beauty is what comes within. First and foremost I’d like to thank Dr. Varese for passing his knowledge down to us. Key words that stood out to me from his timeline lecture are “changes” and “pushing boundaries”. The word changes stood out because through the time period both writers, George Eliot and Charles Dickens, a lot was going on. Queen Victoria’s rule marked the Victorian era, and within this era fashion changed its styles, art changed its ways, technology changed with its modernity, and history changed with the many life changing events. I thought to be pushing boundaries a significant phrase because it appealed to me not only with the ideas presented by Dr. Varese but also with the characters within the novel Middlemarch. What I learned from Dr. Varese was that art pushed boundaries in the ways it was portrayed but he also mentioned how when Eliot was discovered to be a woman, her book sold more and more. I say that is pushing boundaries because compared to the “celebrity” Dickens was, Eliot was writing her own history and changing ideologies surrounding the notion of women. With relation to the book, it is seen how Rosamond was pushing boundaries to climb up the social ladder, Dorothea was pushing boundaries by “changing the style of women”, Casaubon was pushing boundaries with his “Keys to All Mythologies, and it serves for every major character in the novel. So a question that this raises is that was George Eliot trying to hint “pushing the boundaries” as how she did with herself by becoming a recognized author? Through Dr. Varese’s timeline I was able to clearly distinguish the different events that occurred not only in the novels Mary Ann wrote but also in the novels Charles Dickens wrote. Dr. Varese gave us many insights to how the literature world used to be and I was surprised to find out that the Dicken’s novels had been the entertainment for 30 years which is crazy because nowadays a tv show or a movie or a book is only entertaining people for a couple of months and then it’s forgotten as if it had never happened and for these novels to be so popular for 30 years it’s incredible. I also found it very interesting how courageous Mary Ann was during her incognito period because it must have been hard to hide under a different name just for her to be able to publish her novels. I think that becoming George Eliot must have been a real difficult challenge but it’s interesting to notice how it was because of this name that she was able to publish so many novels, and even after everyone found out that she was George Eliot her novels were still being purchased. This shows that regardless of what name she used the talent was there and it was obvious and it did not matter; the names might have been different but it was always the same person writing the novels. As a reader I really wonder what would have happened if Mary Ann had never told anyone her real identity, if she had been incognito for the rest of her life? How might have that changed how future readers see her, would the name George Eliot be the only one we would know today? As a reader I will also challenge myself to read more literature novels with many pages like Middlemarch to insure that I understand the different English languages used in the past. Middlemarch made me realize that authors write novels for a reason, and Mary Ann wrote Middlemarch to show us that it’s okay to critique and endorse the different aspects of life like sympathy, marriage, quest, knowledge, community, and even ourselves. Thank you Dr. Varese for enlightening us with a much broader perspective of such a critical novel. Though your lessons were only a collection of about two hours, they set our minds to further analyze the origin of this novel and how important this novel was to not only the Victorian era, but modern literature. I really got inspired when Dr. Varese talked about his first boss in the tech field and how his boss hired him because of his English major. Because of his English major, it is apparent that he can think, and to me it opened up a different perspective to what it means to study English literature. The skill to analyze and decipher complicated literature and poetry id now a little more inspiring to me than before. Though I wont be majoring in English literature, I am most certain that I will try to explore beyond my academic interests to see what different courses have to offer. I also found it interesting how Mary Ann Evans stuck to her identity of George Eliot, even after she had admitted her true identity. We talked about how the reasons behind why she stuck to George Eliot. She wanted to keep the brand of George Eliot going and even in her tombstone shows “George Eliot” in big letters over her true name. This sense of incognito and how different identities kind of brings up questions about how gender played a big role in people’s careers back in the day and how people like Mary Ann Evans had to even change her identity so that she can be sure that her work would become successful. Thank you Dr. Varese for taking his time to come share his experience with us as well as his knowledge. It was a pleasure to have you with us for a couple of days. The timeline Dr. Varese made for us really helped to understand the history behind the Middlemarch novel as well as George Eliot’s background. I was shocked to find out that George Eliot rejected the offer that Dickens gave for her which was to write for him. It showed a lot of George Eliot’s character and the independent woman she was. In our discussion we talked about whether changing her name to a male name was a gain or a loss. It is both a gain and a loss but in my opinion it had more of a gain. George Eliot was able to do what no other woman was able to do. Through her work, she was able to express herself more and she had no restrictions. Although she had to hide her identity and pass it on through a fake name, the words she wrote were still her words and her work. It takes a lot of courage for someone to do this and she did this in a difficult time. All the characters in Middlemarch have something that reminds of George Eliot. I believe she incorporated a part of herself in each of the characters she made. Something that caught my attention on what Dr. Varese said was that she “forces us to reimagine and her success story, broke the mold.” She lived in a time period where her options and opportunities were limited yet that didn’t stop her. Even so, when she came out and showed who she really was, that took nothing away from her image. Although she continued with the name of George Eliot and until this day still remains, it shows her story. The name George Eliot was the beginning, it was the beginning of story that will continue to grow which is that women indeed are capable of many more from which there should be nothing to stop it, not even society. My goal as a learner and reader is to be able to understand the text more beyond its key points. I want to be able to interpret a novel in the different meanings which is pertains to. I wonder if Eliot approves the way she is remembered and talked about today. At any given point, did she want to throw all her success away? One of the things that really caught my attention was when Dr. Varese said that art can push boundaries. Middlemarch pushes boundaries one of which is, gender roles especially on female gender roles. In how Dorothea and Mary were able to marry someone that people didn’t approve. Even though we have come a long way from where we where in the Victorian era there’s still room for improvement Women are still being oppressed and aren’t taken serious, in the workforce women get paid 20% less than males and women at times don’t get to have a say in what they can do with their own bodies with the whole pro life and pro choice movements. We still need to have artwork to push these boundaries so that we can have the equality that the Construction say we have. Another thing that peaked my interest was on beauty and in how George Eliot view it, Eliot decided to describe Rosamond as beautiful but yet decided to make her personality not portray her outer beauty. Eliot was trying to show that beauty can an end to some people like it was to Rosamond, she was the perfect women yet to perfect for almost any man to try to get with her and when it did happen a disaster happened and things didn’t go out in her way. A question that I have it why is it that we know that beauty is fleeting yet we pursue it a majority of the time? I would like to start off by giving thanks to Dr. Varese. He took time out of his schedule to participate in our Middle lab festival, see our production and even have a discussion with our class. Dr. Varese came to our first period to discuss about the novel we’ve been studying for these past few months, Middle march. The timeline that he provide us enriched my mind more on this novel and other works of George Elliot’s. He began with the author that brought literature to life, Charles Dickens. He explained how he was the star back then in the Victorian times. It was actually surprising to me that Charles Dickens asked George Elliot to work with him, though she turned him down. Though I knew that George Elliot was a pen name for Mary Ann Evans he elaborated more on the subject. Dr. Varese told us that one several people knew about Mary Ann Evans using that pen name. Since no one actually knew who George Elliot looked like, many impostors started to come out and said that it was them. Though she was very scared to do so, since she belied it would ruin her life as a writer, she finally came out with the truth. Since it was thee Victorian times, most women wouldn’t get recognition for being a write, but luckily for her it gave her even more fame. I believe that her hiding her true identity and going incognito was good thing for her, since it did help her to become one of the greatest writers, but I didn’t like the fact that that she did that just because she was scared she wasn’t going to get anywhere because of her gender. Another thing that interested me was how back then instead of realizing the whole novel at once, it would actually be serialized. It gave everyone a chance to read and own books and not just the wealthy. One question I have is if Charles Dickens knew that she was a women, would he still want to collaborate with her? One of my takeaways from Dr.Varese’s lesson was the impact George Eliot had on the Victorian era as well as her connection to Charles Dickens which was very surprising. In the timeline presented to us by Dr.Varese we can see that Charles Dickens published for many years, taking up most of the time during Queen Victoria’s reign in addition to the new advances in technology Charles Dickens was able to become a national “celebrity” becoming one of the influential writers that helped democratize books in his time. At his prime is when we see George Eliot begin to publish her books. As we already know she publishes her books as Marry Ann Evans instead of George Elliot because she wants to be taken seriously as a writer and she knows that in her time women are taken less seriously.But somehow Charles Dickens has a feeling that “George Elliot” could not be a male writer and according to Dr.Varese it is because George Eliot writes about female characters in a very deep connective way as if “he” was actually a women that understands their feelings and thoughts. As we go into more of George Eliot’s life we can see that she is not necessarily an ordinary person and she didn’t want to be ordinary either. She didn’t want to write like Charles Dickens or even publish like him, although she couldn’t anyway due to her frequent migraines. Her unique writing style that combines entertainment and science captivated the world after Charles Dickens death allowing for both audiences to combine and worship her work even after George Eliot came out and confessed she is a woman named Mary Ann Evans. This is really inspiring to see as it proves that it does not matter what limitations are placed in society if you can do great things, make a change, and captivate the world nothing can stop you. I have noticed that these traits are constantly seen in people that have changed the world throughout history. One question I still have is what would have happened if she began publishing as Mary Ann Evans since the beginning instead of George Elliot? One of the main discussions was about beauty in George Elliot. It was very apparent that she was an ugly person so instead her view on beauty was more virtue based and idealistic rather than based on sexual prowess. She wanted to make life beauty, everyone’s lives to. So in the end we all have opinions. Furthermore we discussed cliff hangers. Cliff hangers are a great way to keep the fan base yearning for more content. Such novels include Oliver Twist and Middlemarch, which both are a series of novels. No matter what the price , people will continue buying books in order to ease the anxiety caused by cliff hangers. We discussed that it is human nature to seek more knowledge to satisfy their need for the truth. Thank you Dr Varese. Thank you Dr. Varese for taking your time to lecture us about the victorian era. I gained valuable information concerning George Eliot or Mary Anne Evans, Charles Dickens, as well as other critical information on the victorian era. Something I had found really interesting was Dickens’ and Eliot’s contribution to democratizing literature around the 1800-1900’s. It was really Dickens who had first democratized literature by giving everyone the chance to purchase his literature by charging very little. This way absolutely everyone had the opportunity to read, regardless of their class or social ranking; literature was usually something that only the elite of the time could read. But with Dickens he had changed that, and George Eliot helped continue that after Dickens death. I was also surprised how coincidental it was that George Eliot’s Middlemarch had been published just a year after Dickens death, quickly grabbing his audience and making it hers. I also learned that serialization had begun during the victorian era, and how serialization really impacted literature. It had impacted literature in a positive way in that it started a feeling of suspense, wonder, and excitement for everyone since only a section of a book was released, before the releasing of the other sections. This is also the case for many shows or movies in todays world but I had genially never known that serialization had begun with book dating back to the victorian era. Lastly I was surprised at George Eliot’s background: how her real name was Mary Anne Evans and that George Eliot was just a pen name she used in order to sale her books. I understand the gender roles of that time so I know why she had to use a pen name in order to get her work out there, but I found it interesting how even after the people had found out that George Eliot was Mary Anne Evans, she still decided to continue publishing books with that pen name. I thought it was something she couldn’t get away from because after all George Eliot is a part of her, so that’s why she continued to be referred to as that pen name. Ever her tombstone has the name George Eliot in big letters and her real name in smaller letters, because for a long period of time George Eliot despite it being a fake name, got her where she is now. Dr. Varese taught us about timelines, how the author lived, in what time period she lived in, and how the world was around her in that time. Knowing that it was hard for women to get looked at seriously. She had to change her name to a man to get more attention. A key word that stood out to me was “Inspirational”. The word inspirational stood out to me because George Eliot was still using her fake name even though everyone knew who she really was ,”Mary Ann Evans”. By knowing this not only did people wanted to know more about her but she had been hiding her true self from the world and she was able to make a huge impact to people lives. What also stood out to me was hearing that Mary Ann Evans was a very ugly women and knowing that made me realize that everything is not all about beauty but the most important thing is knowing that she had a great personality. Relating to the novel how Rosamond had beauty but to me her personality was horrible she was one-sided and was only in it for the money such as Dorothea, she is a simple women but what stood out was that she was very compassionate and caring. The question that I’ve been thinking about is what if George Eliot made a character with Beauty and Personality would all the drama and attention would only be on her? or would everyone even like her ? Or hate her ? I would like to start off by saying a thank you to Dr. Varese on the great intensive on Middlemarch. Something that stood out to me first was the timeline and how all the events seemed to connect and fit perfectly with each other. Like the fact that the Victorian era was when Queen Victoria reigned. Or just the fact that Dickens and Eliot wrote their novels around the same time period. A key phrase that I picked up from the intensive was “boundaries”. Boundaries stood out because I had no idea of the types of boundaries that the authors or time period pushed. An example would be pushing the boundary of art and gender roles. I think that pushing the boundary of gender roles was really significant and it was a phenomenon, as Dr. Varese had mentioned in his lecture. Pushing the boundary of gender roles was a big risk that George Eliot took in order to make their story popular in that time period. I find it inspiring how they went out and did something so risky as to choose a pseudonym and write about science, which is what would’ve been controversial back then for a women to write about. When Dr. Varese mentioned that she published a book as her real name and that it became popular was just something that I found amazing. An ‘aha!’ moment for me was when the topic of “unvisited tombs” came up. As a part of the Middlemarch production and memorizing that last line without really understanding what unvisited tombs meant and then figuring out the meaning behind those words was really eye opening. I want to thank Dr.Varese for taking his time to come share this amazing experience with us, the Middlemarch production, as well as come share a very interesting lecture with us. Dr.Varese’s timeline helped me have a better understanding of the time period the novel was written has well as more interesting facts about the author Mary Ann Evens, known by her pen name George Eliot. Something I learned which was very interesting was the Vicortian time period being named after the Queen Victoria. One point of discussion duirng the lecture was the concept of beauty and how physically Eliot was not beautiful which ties to the lie in the novel where it says ” I would like to make life before, I mean everybody’s life.” I understood that due to her physical lack of beauty she refer to making people life beautiful internally. Dr.Varese also shared with his that she question herself if she was beautiful because she actually ended one of her novel with a question regarding beauty. Another topic of discussion was the cliffhangers authors during the time period used since they would release their books in series not all at once. They would use cliffhangers to leave the reader wanted to read the following book but Dr.Varese shared with us that the books were released very 19 months. Cliffhangers was away to attack the audience but were only use a a couple of times throughout thr entire book as a whole. Dr.Varese’s lecture was very informative and interesting. I learned a lot and had a deeper analysis and understanding of Middlemarch and the time period as a whole. As the Middlemarch production was coming to an end, we had Dr. Varese visit our classroom and join us in our conclusion of this intensive. I have learned in his lecture of the timeline of the Victorian era that during the creation of Middlemarch was the last moments of Charles Dickens. Nonetheless, how Middlemarch was published a year after his death and published differently from what Dickens novels were known for as published series. Despite acknowledging the history behind what has inspired the creation of the world in Middlemarch in the years around 1835, I found the lecture on beauty to be rather interesting along with the concept that it handicaps. Very much, like Casaubon I believe in that he is blinded by his desire, nonetheless his obsession towards completing the Key to all Mythologies the ideal of seeking beauty has a similar concept of deception. It is a paradox of seeking beauty that will enable you to move forward in society as what Rosamond desire and very much so with the sought of the ideal of perfecting the sense of an object in its presence. Casaubon may not seek beauty, but it is the interconnections of desiring of making an object better that makes the idea of beauty being critique by its egoism. It is as if George Eliot was actually questioning “what is beautiful?”. Lastly, I would like to thank Dr. Varese for his support of our production while enjoying our performance, but lecturing us on the Victorian epoch. Thank you. My last question is perhaps already answered, but what is casaubon’s purpose to the entire themeatic plot of Middlemarch, what is his effect to the novel? Is the Key to all Mythologies a representation of our blindness when seeking our desire such as beauty? Before anything , I would like to thank Dr.Varese for his taking his time to give us a little talk about Middlemarch and for sticking around during an important event , Middlemarch .When I first picked up the book Middlemarch and read the author name “George Elliot”, I thought it was a male who wrote the book. As Dr. Varese gave us a lecture on a timeline. This timeline helped me understand the time period the novel that was written. I never knew that George Elliot wasn’t the real name of the person who wrote the novel. The person who wrote the novel was Mary Ann Evans, a women. I learned that the reason she wrote as if she was a male was due to women not being looked at as men did. As Dr.Varese told us that Mary Ann Evans came out and told people the truth that she was a women , I felt like I could connect the character Dorothea Brooke with Mary Ann Evans. Evans made a sacrifice on risking her novels not being sold due to her being a women ,but she did it anyways. Dorothea made a sacrifice on loosing a fortune from Csauabon to marry the guy she loved which was Will Ladislaw. Both made a sacrifice that lead to there happiness which I loved. Thank you Dr. Varese for your taking time and coming to talk to my class, hope your flight back home was good. Through Dr. Varese’s timeline I was able to have a better understanding as to what was happening during George Eliot’s time as a famous novelist. Dr. Varese gave us a comprehension to the community of fans that was around the Victorian time period and their relationship to not only George Eliot’s novels but their relationship to literature as a whole. The community of fans then and the community of fans now are different in the way that back then readers of literature spent many months following and reading a novel so their experience with the novel was expanded. But as with movies in today’s time we go sit in a movie theater for two or more hours and then it’s over, we might go ahead and talk about the movie afterwards but the experience really ends in those two hours. But we do have something that lasts over months and that would be t.v shows and serialization which have a lasting feel over the period of months. Connecting it back to the novel, Middlemarch, the community around you does impact you and the way you interact and digest events. For example there are forces around you like gossip that can impact you shortly just like movies but then there are forces and events such as crisis and sympathy that extend over a long period of time or even a lifetime just like literature. One question that I was wondering was what would have happened if Mary Ann had never publicized her real identity? Would the imposters that were claiming to be her somehow would ruin her reputation? Thank you Dr. Varese for coming to our class and sharing your knowledge about Dickens and George Eliot. I want to touch on the discussion we had about the last sentence of the book. I was quite surprise by how much information we were able to gain with just a few words. Along with the Eliot’s background information that we were fortunate enough to learn about, we were able to decipher the last sentence into a meaningful message that connected to both Eliot and us, as the readers. The last sentence was about how Dorothea impacted many around her from her good will and no expectations back. Also the last words that said she laid in and unvisited tomb brought a lot into our discussion. We were able to highlight the hidden messages as you don’t have to become very well known to have your actions in history count. Small helpless actions we start to do now come pile up later making a great impact. And a fact that I found interesting was how the novel ends with “an unvisited tomb”, and Dr. Varese mentioned how Mary Anne Evans’s tomb has her real name in small letters and her pen name “George Eliot” in big letters. This emphasizes how when people go visit her tomb they go visit George Eliot’s tomb meanwhile she lays on her unvisited Evans’s tomb. Dr Varese taught me a lot of new things from the 1800’s like how books were published and how they were released every month.He made a timeline where he gave important dates about literature and how they became popular. First I would like to say thank you so much Dr. Varese for taking your time in sharing your knowledge on Dickens and George Eliot. It was very interesting to know the history and background of the amazing novelist in the world and how each individual were able to write their novel through specific time periods in history. Something that really had caught my attention is when Dr. Varese told us the history on how the victorian era got its name and it was because of queen Victoria, in which it had all made sense when it was said. What I feel mostly helped through seeing all these events and how things connected was making a time, through this timeline I was able to see the certain events that happened through that time period and when Dickens dies a year after George Eliot publishes her famous novel Middlemarch. I found it so powerful how George Eliot ended her novel with the word tomb because when you think of tomb you think of death but in this case she is referring to Dorothea and how she impacted many around her but doesn’t expect nothing in return. As we discuss a different perspective in the class is was very interesting to see how Eliot uses “unvisited tomb” to describe how we don’t have to be famous to have impact someone as Dorothea did but even your small actions can make history through the word with one individual because then that person would speed it throughout their lives and it would just keep continuing. My favorite part of all was When Dr. Varese gave us a interest fact on how her name is really Mary Anne Evan’s but since in those days women weren’t considered as much, is to why she put her name under George Eliot and now on her tombs stone she has George Eliot really big on her tomb and under is her actual name, and i found that very interesting because she wrote such an amazing novel but is still didn’t get recognized as Mary Anne Evan’s. Although I did not get to see the first lecture, I did appreciate the second lecture. Something that stood out to me was the idea of beauty. Specifically when we were discussing how beauty can be an individual’s handicap. In other words, physical features can be the downfall of a person because it can be the only thing that is considered beautiful. Without a ambition, empathy, and sympathy, the person becomes self centered. These self centered emotions affects relationships with others and perhaps marriage as well. We see these downfalls within the marriage of Rosamond and Lydgate. Rosamond was looking to up her social status which is selfish. As a result, Lydgate was never given the real beauty which is within and on the outside. These downfalls happen when you do not use small and big lenses to analyze the true identity of a person. I also liked how a person being beautiful is also tied to making others life beautiful. Having the ability to spread love to others solidifies your true beauty as a person. Actually appreciating something not just for it looks, but what is being offered is what I feel Dr. Varese and Eliot is emphasizing. A huge thank you to Dr. Varese for coming out and giving our class the lecture and words of wisdom. Thank you. I would like to start off by saying thank you to Dr. Varese for flying out to Los Angeles and sharing brilliant facts. Something that I took out from Dr. Varese and his ideas was that he really brought me into a realization that there is always time for everything. A key moment that really stood out to me was when he mentioned that the Mary Ann Evans also known as George Eliot had revealed her gender because it was getting out of hand who she really was because random people started to claim her work and say that they were the real “George Eliot”. There was a moment in history where she was about to publish a book when people where trying to take her credit for her long working hours that she had put into a novel. During that time she decided to reveal her true self demonstrating her braveness because during the 1800s there was not a woman writer as intelligent as her who had a lot of fame in their work. When the great George Eliot came out to the public as her original self , the public did not hesitate to purchase her book / novel even though she was a female writer because they knew that it was going to be a great a piece of work. A general question that I have towards George Eliot is that why did she hide her true identity even though she knew that her novels were very successful in being purchased all around the world? Was her assistant holding her back from exposing herself as Mary Ann Evans? thank you Dr. Varese for you insightful knowledge in the victorian era many of us including myself did not ever think much of its importance. From how popular Dickens became to how Eliot rose to fame highlight the fascination in the victorian time. one thing i never know was why i was actually called the victorian era, but surprisingly it was the life span of a queen. your dedication to help us become more knowledgeable is much appreciated and we hope you continue to aid the NAI family in our journey to understand the complete opposite time frame different from modern culture today. Thank you Dr. Varese for flying in and being part of our lives in Middlemarch. I learned many new things during our class discussion on the timeline of Victorian literature but three things stuck out to me the most. One being the fact that Charles Dickens believed in literature for all and that’s why he would sell at such a low price. For some reason I feel like many people see him as this man that was in control of everyone and idolized by many but I feel like this shows his love for literature and his desire to share it with the world. Something else that stuck out to me was the fact that George Eliot had a major break through after Dickens’ death. It left me with the question would she have been as successful with Middlemarch if they would have both taken out a book at the same time? Finally the last thing that stood out to me was the way you described Eliot’s tombstone. The fact that it stated George Eliot in a much larger font than her real name left me with many thoughts. Did she preferred the life she created over her real life or was George Eliot now considered her real life? Thank you Dr. Varese so much for taking time out of your schedule to come and drop some knowledge on us getting to know you alone was such a great experience along with what you taught us. During your lectures in class I learned many things but one of my favorite parts of your lecture was the background of George Eliot. I thought was really funny how she lived her life. The fact that she lived with a man named George who had a wife in another house. And also how you said that after her husband married her he jumped out of a window killing himself after realizing what he did. Which was pretty messed up but also kind of funny. I also really liked the timelin we did. Especially how it showed the Wars we’ve had it was crazy how the past kept repeating itself. It’s like you’d think we’d have learned our lesson by now but I guess not. Thank you again so much Dr.Varese hope to see you again see. Thank you for being apart of our middleman life Dr.Varese. Dr.Varese brought many new things to my eyes the last two days he was here with us, but two things lingered on. One was the when he went in depth on the last sentence. Her spoke about George Elliot’s unvisited tomb and how Maryann is the unvisited tomb but GEORGE ELLIOT is the tomb name in big letters. The second thing was said by Ms. Barrios when she brought up a essay question able whether Beauty was challenged or was beauty redefined with middlemarch. And I felt Beauty was challenged within middle march because Rosalind was handicapped by her Beauty because she was the ideal Victorian women and fiddling really know how to file all with someone like lydgate giving her a hard time, But Dorothea on the other hand really didn’t care about being beautiful she was just seeking beautiful knowledge. And within middlemarch Beauty was interconnected. I would like to Thank Dr. Varese, for not only his attendance to both the days of our production but for willingly teaching us about literature and its complexity. the timeline in general was interesting and overall very helpful for me to understand how George Elliot came into the life of literature and her life span. It helped me see her connection with Dickens and how important she was in the Victorian era. Though Elliot lived most of her life in “incognito” I think her experience was a positive gain. Though she was born as Mary Ann Evans she became this exemplary figure named George Elliot— she had the opportunity t live in respected shoes. She had a multi-identity. George Elliot was a unique writer because unlike typical authors she did not follow by the typical formula but instead broke that cycle and broke the formula. it must have been difficult to reveal her try e identity in the crows of judgement, but I thought it was brave of her to confront everyone. it is difficult for me to place myself in her shoes where she had to live in the fear of not being accepted for her gender. keeping her brand reveals her true strength to maintain her image of respect and honor. I wonder if her literature would she be as appreciated if it was under her true name? Though interpreting this novel was a difficult task, i plan to take this whole experience to lead and assist me with future novels like Middlemarch. I would like to thank Dr. Varese for taking time away from his schedule to participate with this us during MiddleLab Festival, the show, and stayed a few more days after to show to give us a lesson. I enjoyed creating the timeline in class with Dr. Varese because I was able to see all the important events from the past to the present and how some of them had a connection with other events. An important word that stood out to me the most during Dr. Varese lesson was “boundaries” because he explained how you must break the boundaries in order to succeed. He connected this with Mary Ann because in the past women weren’t seen as writes and it became hard for women to publish a book. Another thing I enjoyed that Dr. Varese said was the tombstone because the name that was in big letters was “George Eliot” and under that name it said “Mary Ann Cross”. This stood out to me the most because the Mary Ann was the person who was actually buried there. George Eliot was just a fake name she used that allowed her to publish her book because if they knew who she really was, they wouldn’t let her.